Funny story: My grandma loved Red Velvet cake. Like love, love, loved it. So one year, when she requested it for her birthday, my dad soon found that Wal-Mart was clean out of the mix for it. (And since Wal-Mart was basically the only shopping center around, that was very bad news.) He got a little creative and bought a white cake mix and dyed it red, thinking he could fool her. One bite and she proclaimed, “Oh my goodness, this is the best Red Velvet cake I’ve ever had!” We seriously all just about died laughing! It’s kind of an inside family joke now – the time that Dad lied to Grandma on her birthday. She has passed away since and I don’t think we ever did tell her it was a fake. Don’t worry though, this recipe is definitely not a fake. 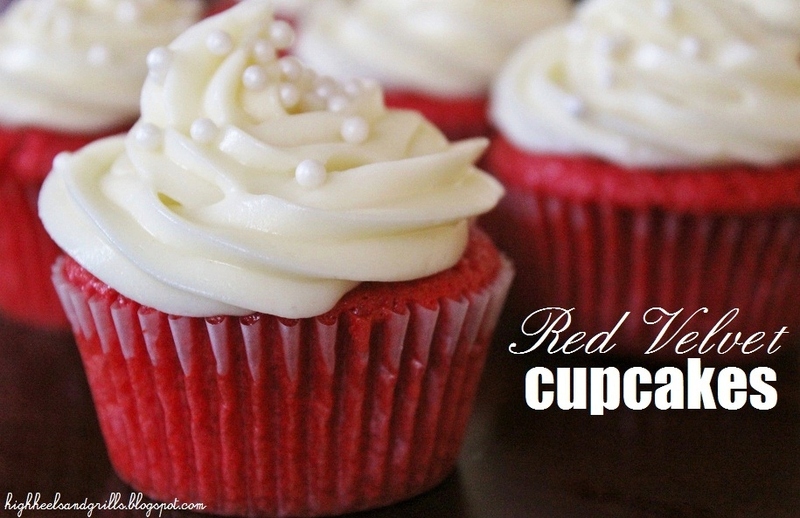 It is the best Red Velvet that I really have ever had! Of course, I don’t know how anybody could not love a Paula Deen recipe. CUPCAKES: Preheat oven to 350 degrees Fahrenheit. Gently beat together the oil, buttermilk, eggs, food coloring, vinegar, and vanilla. In a medium bowl, sift together the flour, sugar, baking soda, salt, and cocoa powder. Add the dry ingredients to the wet mixture and combine well until smooth. Line a muffin tin with cupcake papers and fill each one about 2/3 full with batter. Bake in oven for 18-20 minutes – test with a toothpick for doneness. FROSTING: Mix cream cheese, butter, and vanilla together until smooth. Add the powdered sugar in small increments, on low speed and beat until incorporated – increase the speed to high and mix until light and fluffy. Frost cupcakes with a knife of pastry bag. Sometimes when I bake cupcakes, I pretend I’m on the Food Network’s Cupcake Wars. You should try it. It’s more exhilarating than you’d think! Linking up here: The 36th Avenue, Momnivore’s Dilemma, House of Hepworths, Katie’s Nesting Spot, Something Swanky, A Glimpse Inside, The Shabby Creek Cottage, Somewhat Simple, The Crafty Blog Stalker, Christina’s Adventures, Fireflies and Jellybeans, The Mandatory Mooch, Sweet Little Gals, Delightful Order, Hubby Made Me, Five Little Chefs, Two Yellow Birds Decor, Thrifty 101, Rhinestone Beagle, Real Housewives of Riverton, Domesblissity, Beyond the Picket Fence, It’s a Keeper, Made in a Day, Kitchen Fun With My 3 Sons, Not Your Ordinary Recipes, Simply Sweet Home, Simply Designing, It’s a Hodgepodge Life, Thirty Handmade Days, Whipperberry, At the Picket Fence, Delicate Construction, Stuff and Nonsense, Happy Hour Projects, French Country Cottage, My Romantic Home, Just Winging It, Run DMT, Foy Update, Tater Tots and Jello, Family Ever After, Too Much Time On My Hands, Be Different Act Normal, Funky Junk Interiors, Young and Crafty, Classy Clutter, Serenity You, Polkadot Pretties, Lovely Crafty Home, KB and Whitesnakes, Gingerbread, and Here. Me too! Aren’t they so good?? Thanks so much for linking up Sarah. Always great to have new followers. I’m your latest follower. Can’t wait to ‘sift’ through your recipes. They all look fabulous! Ha!! That’s such a cute story! And I totally agree–who doesn’t like a Paula Deen recipe?! During Christmas, my grandmother always makes red velvet cake balls, and this sounds like an awesome recipe to try it with! These look so good! And they’re topped off with cream cheese frosting yum!! I’m gonna have to make these. Thanks for sharing. I love red velvet cake. Thank you for sharing. I love red velvet cupcakes and I love Paula Deen! I am drooling now … Thanks 🙂 These look so good! Red velvet cupcakes..delicious and “dangerous”.. Yum! Great photo, too. Red velvet is my fave after chocolate! Your cupcakes look simply delicious! Yummy! I love red velvet. These look delicious! Found you through the blog hop. Can’t wait to try this recipe, maybe tomorrow! Joined your site as a follower, so I’ll be back! Ok – I admit it, I’ve never tried red velvet cupcakes – but I’ve seen them around so much, I’m pinning these and I’m going to give them a bash! Thanks for the inspiration! Love that fun story! It mostly struck me as really kind of your dad, who wanted to make his mom happy, that is so sweet! Another gorgeous photo, too, love the little pearls on top! Thanks so much for linking up to Make the Scene Monday at Alderberry Hill. You are being featured later today! Yes, it is 1 and 1/2 cups. It does seem like a lot, but you’re also not using any butter or anything either, so this makes up for it. I hope you like them! !